TWO elderly women from Dete in Hwange district have been each sentenced to 12 months in prison for blocking the Dete-Cross Dete road using stones and tree branches. 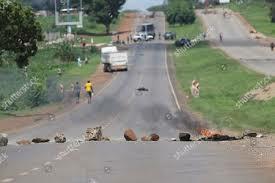 Ruth Dube and Angeline Moyo both aged 55 also forced pupils to join them as they joined opposition instigated demonstrations on January 14. Dube and Moyo of Magoli and Dingane villages respectively pleaded not guilty to obstructing or endangering free movement of people and traffic when they appeared before Matabeleland North magistrate-in-charge, Mr Livard Philimon. They were convicted yesterday after full trial and sentenced to 12 months each in jail. However, the two women will not taste prison life after the magistrate conditionally suspended the sentence. Three months were suspended for five years on condition of good behaviour while the remaining nine months were suspended on condition they each complete 315 hours of community service at Dingane Primary School. Prosecuting, Mr Vumizulu Mangena said Dube and Moyo blocked the road on three different points in a stretch of five kilometres. “On January 14 the accused put tree branches and stones along Dete-Cross Dete road. They also wanted school children to help them but some refused,” said the prosecutor. A witness Ms Barbara Munkuli said Dube and Moyo, who were drunk when they committed the crime, complained that transport operators were overcharging travellers. Pirate operators charge $5 from Dete to Cross Dete which is 16km. Appearing before the same court was Freddy Muleya (29) of Chentali also in Dete who was charged with a similar offence. Muleya was accused of using logs, stones and tree branches to block the Bulawayo-Victoria Falls road at the 310km peg in the company of an accomplice on January 15. Muleya was, however, found not guilty of the offence and acquitted. The three were represented by Mr Thulani Nkala of Dube, Nkala and Company.